Friends of mine have circulated an ad for the Episcopal Church on Facebook. The ad portrays a female priest, a gay couple with two children, and a handsome fellow raising a martini. 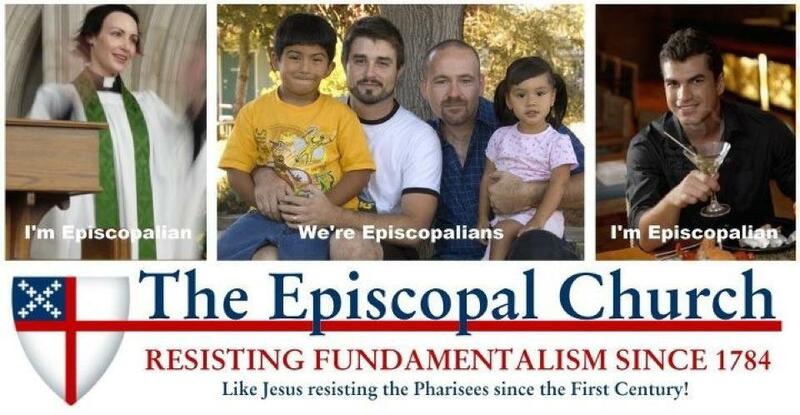 The text of the ad says, “The Episcopal Church: Resisting Fundamentalism since 1784.” The ad almost looks like someone with the intent to mock the Episcopal Church crafted it as a vaguely metrosexual (a word that spellcheck is uncomfortable with) fellow toasts us with a martini. The sentiment of the ad seems to be that the Episcopal Church is not the kind of religion that marginalizes women and gay Christians. The problem is that the ad seems to communicate that we are the kind of religion that sees ourselves as better than many other Christians. Recently someone else I know posted an ad created by breakaway Anglicans which depicted the Presiding Bishop with the tagline “Don’t believe any of that crap? Neither do we.” The ad was an obvious (or maybe not) hit on the Episcopal Church’s doctrinal wobbliness (as the breakaway cleric sees it) and our apparently flexible approach to Scriptural warrant. The friend posted it without irony believing it to be a progressive statement of the Episcopal Church’s liberation from outmoded beliefs. It was one of those moments when mockery and self-awareness passed one another by without a backward glance! On the negative side, answers also were “snobbish” and “elitism.” The ad above reinforces these unfortunate stereotypes both in its text and especially in that third picture. What are we communicating as our core identity? Answers ran the gamut. However, the main theme was that the Episcopal Church was open and welcoming to all. This is a good thing – but it is not the heart of the thing – the “thing itself” as DeKoven says. Toward the end of the video a member said, “The Good News of the Episcopal Church is that Christ has died. Christ is Risen. Christ will come again.” He had the Good News exactly right. The Good News was not an answer to unfortunate strains of Christian fundamentalism – the Good News is that we preach Christ and Him crucified. As I attend meetings of clergy, diocesan conventions, see online posts, and the like I have become increasingly worried that many in the Episcopal Church see our vocation as an oppositional one. For many, our message is that we are not the Christians that scare you. Really. The challenge is that oppositional messages are rarely the ones that capture the heart or the imagination. They might be emotionally satisfying for the moment – a kind of cathartic response to seeing the Church used as a vehicle for political or cultural voices that victimize all too many. Ultimately, the Episcopal Church cannot simply be a response to misrepresentation of the Gospel, it must be a voice for the Gospel. There are varying voices in the Church that define themselves by saying what we are not. We are not Roman. We are not Evangelicals. We are not fundamentalists. On it goes as we ever define ourselves on others’ terms. Who are we though? This is the crux of our Church’s dilemma. We struggle to say who we are without saying who we are not. We might begin with our Catechism and some of its answers to the core questions of the faith. I chose these particular answers because they articulate an Anglican approach to grace, joy, repentance, offering, adoration, and hope. Were I creating an ad campaign for the Episcopal Church, I would begin with these Anglican answers to the core questions of the faith. Those searching for a church home are often looking not for an agenda or a church defined by its opposition. They are searching for a church that will enrich their spiritual lives, help them raise their children, fill some deeper yearning, help them help others, and more. The reasons people come to church are as varied as the people themselves. At its best, the Episcopal Church offers an apolitical inclusion that embraces all as they search for the One who is All. The Church is not a response to the world around us but a response to God. The Episcopal Church lives into this response of love and self-offering in manifold ways that are expressed in the answers of our Catechism. 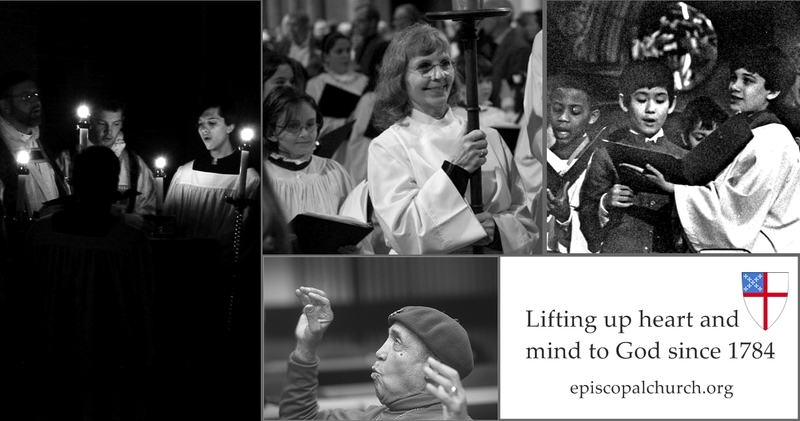 We might also use Scripture, language from the liturgy, or hymn verses – in other words those things that bind us together as the Body of Christ in this Church – to articulate our shared witness and faith. Yes, the push for justice and equality are part of a response to God. However, that cannot be the defining character of a Church that hopes to grow and serve Christ in ever expanding ways. We have to be more nimble, more full of joy, more creative than that. We cannot allow any agenda to define us. Whatever the agenda is it can never capture the fullness of our life in Christ. All we can do is attempt to describe our life with and in God. As we do that, we offer, in fits and starts, a glimpse of our collective response to God as the Church. Agendas are part of our life as the Church. Every wing, faction, and group within the Church has an agenda – items and articles that it elevates or prioritizes. Each of these expressions is one part of the totality of the church. The Episcopal Church is a way of being in response to God. An ad campaign for the Episcopal Church should stress how we worship together, how we live together, how we pray together, how we serve together, how we adore Christ together. An Episcopal Church campaign should offer the Episcopal Church as an alternative not to any other church, denomination, or cultural prejudice because faith is greater than the sum of that which is opposed. We are a Church of grace, dignity, awe, reverence, prayer, hope, and joy. We do ourselves a disservice by ceding the ground upon which we define ourselves to others. With this in mind, I dawdled around and made what I thought would be a good first ad in a string of ads communicating an Episcopal Church identity. I like the “since 1784” tag so I used that but I think it could be blended with different images and text to offer a broad image of the Church. Another “on target” analysis. Your alternative ad is well worth funding. Now all you have to to do is find a Texan oil man to support it! Resisting Good Grammar Since 1784 just doesn’t have the same ring to it, I suppose. Totally true. So many don’t realize the difference between an adjective and a noun when it comes to Episcopalians!! Good for you, MAG! I like your new ad, I generally agree with your critique of why the add in question only represents a sliver of what the Episcopal Church is. Your ad, however, notes nothing that marks The Episcopal church as different from any liturgical church. The ad from 815, with all it’s faults, does. Your ad presents to the LGBT community and women that the Episcopal church fits into their preconceived notion of church as a place not necessarily for them. The ad from 815 breaks that idea apart. Your ad enfranchises the societal norms that the church has helped enforce for generation, 815’s ad enfranchises ideas outside of those norms. The full Gospel, of course, is in neither place. I’m a trans woman who has found a home in the Episcopal Church. I deeply love the Church. In a few short years it has become one the bedrocks of my life. The problem with your new ad is that it in no way shows what is wonderful about the Episcopal Church. At my parish we have a married gay rector whose husband and son are both active in the parish. The associate priest is a woman from India. There are white folks and black folks and latin folks and Asian folks all worshipping together. There are families with gay parents and straight parents and trans parents. The diversity, that openness, that wealth of love is what brought me to the Episcopal Church, what brought me back to Christianity. The Episcopal Church is not some mild, half hearted, talked about rather than shown response to God’s love, no we’re something wilder and more power. The Episcopal Church lives its love, fights for its love, celebrates its love. It makes room and shifts the foundations of the world with its love for humans and for God. Truly Christ has set us free! Truly Christ has defeated sin, death, and the grave. By accepting all God’s children, by fighting for us all, the Episcopal Church lives into that love and it shines and calls the despairing and the broken hearted to the Lord! Saying that you respond to God means nothing, means less than nothing, if you don’t SHOW that response to God! Worse yet, saying it often lets people feel like they’ve done enough and thereby let them feel like they’re off the hook for actually responding to God. Your mild photos of middle class white fail to mean anything because they show no radical response to the Love of God. If I may, I firmly believe that doing something as counter-cultural as gathering in community once a week (or more) to affirm a 1700-year-old Creed, sing music not played on any radio, partake in the Body and Blood of Christ, wear strange clothes, and, at the end of it all, maybe even allow ourselves to be renewed and transformed through these odd things — that’s a fairly radical response to the love of God. I do not think anyone is saying that is not true. I think generally that is why Sarah says she goes to church. The issue is that a large portion of the population strongly feels the church and Christianity says that they are not allowed to take part in that process. This is exceptionally true in the LGBT community. I believe the point of the initial ad is to make those individuals fully aware that they are welcomed to take part in this radical response to God’s love. The issue I see here is the actual question that involves the step beyond the ad. Are we as a church willing to be renewed and transformed into a more full body of Christ by the presence of individuals we have for generations named other. Are we willing to recognize Christ in them and be change ourselves on account of our own falleness and their blessedness as much as we expect them to change. If we feel that as we stand we are doing enough without this invitation to radical change by all parties then we obviously are not and we might have found the reason why renewal and transformation in the Eucharist is so rare. I think everyone should create their own triptych of what the church is to them, and we should create a board on tumblr or pinterest for people to share them on. What I’m getting from the original ad and from yours, and from the comments, is that we each have our own, and the Episcopal Church welcomes all of them. This is an excellent exposition. Thank you for your thoughts, and for the proposed ad. I just caught this blog a month after the fact. I certainly see what the concern is about the 815 ad, and I understand the response about Fr. Robert’s alternative ad as being too milquetoast, though it demonstrates exactly what I love about the church. I’d note that there are women and people of color in Robert’s ad. I’ve made many local ads and “catch-phrases” for my parish church for almost twenty years, always juxtaposing an offer of full inclusion with a promise of ancient tradition. Having thought about the points made, I think the state of the church is such that both kinds of ads are still very much needed. As much as there needs to be, must be, a powerful message out there of faith in a Saving Christ which the Episopal Church affirms as “the Thing Itself,” current society it not such a place that we can stop talking about what the Episcopal Church is not. We dare to say that the Spirit has led us to new, exciting revelation about the Gospel where women and LGBT folk are concerned, and that we think the vast majority of the Christian world is in error on these issues. We also stand against the harshness of a very large and better known segment of Christian society concerning issues like the status of divorced persons, a respect for both sides of the reproductive rights argument, the idea that creature comforts and festivity are not necessarily occasions for sin, and that scientific-skeptical thinking is to be respected rather than labeled non-faith. This prophetic witness sets us apart. Finding this in the Episcopal Church is why many church-hurt people from other denominations come to us, as much as finding a caring community in love with God and meeting God in worship. This is not ideal, I know, but it’s the state of things now. What constantly frustrates me is that in so many ways the Episcopal Church IS the reformed Roman Catholic Church which millions non-church-attending American Catholics say they want, but don’t expect to see in their lifetime. Despite our rather minor efforts at “ad campaigns,” most of these people have no idea what we are like. It is thought politically incorrect, ungenerous, and anti-ecumenical to produce a campaign pointing this out and targeting “former” Catholics or Orthodox, even in the face of the Anglican Ordinariate being introduced by Vatican into the United States. There, indeed, is a failure of will.